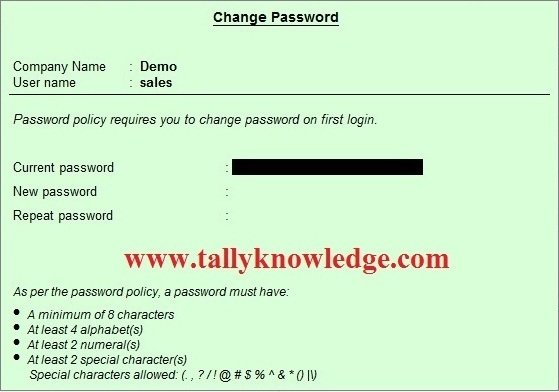 Home / TallyERP.9 Lessons / How to secure your Tally data with High Security Password? How to secure your Tally data with High Security Password? When you trying to register / signup on some sites then those sites ask you to please enter strong password like contain 1 Capital letter, 1 special character, 1 numerical character etc. These kind of passwords is very secure. Generally, Tally users make password named "Admin" or their own name and the password is same. But do you know tally has the feature to make your password unbreakable. Through this feature no one can break user password. Use this feature for 2nd user. How to Enable Strong Password for your Data? Allowing this option to Activate Password policy. Select Yes to Activate Password Policy. Enter number of days for expiry period of your password or enter 0 to disable password expiration. Select Yes to notify users before password expire (Select number of days for get intimation by tally for password expiry, for example if i select 5 then tally notify me before 5 days that my password comes expire after 5 days). Select yes to Restrict the use of old password and enter the number of old password you use previously, for example if i enter 3 then system not allowed me to enter those password which i used last 3 times. Select Yes Change password on first Login to Yes. Select yes to Allow users to change password. Now go to Users & Password Section. Select Security Level - User and Controls and enter user name and password which you want. Press F12 for configuration and select yes to apply password policy. Select yes to Apply password policy. Close the company and reopen, it will ask you to change the current password. Remember you set password only which you describe on password policy level. Now noone open or crack your tally data password in any way.